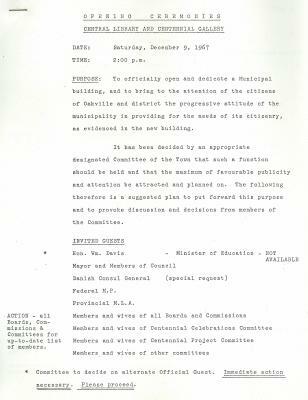 Documents that contain details regarding the opening ceremonies of the Central Library and Centennial Gallery. Includes a purpose statement, guest list, a transcription of the official invite, suggested program, parking plans, public address system, floral arrangements, press release plans, suggested masters of ceremonies, and publicity pamphlet plans. Davis, Wn. ; Cooksley, Ronald J. ; Walker, Murray ; Dyson, H. ; Bateman, Wn. ; Atkins, George ; Walker, Bill ; Caine, J. ; Cornwall, J. ; Pullen, D. ; Forsey, R.
PURPOSE: To officially open and dedicate a Municipal building, and to bring to the attention of the citizens of Oakville and district the progressive attitude of the municipality in providing for the needs of its citizenry, as evidenced in the new building. It has been decided by an appropriate designated Committee of the Town that such a function should be held and that the maximum of favourable publicity and attention be attracted and planned on. The following therefore is a suggested plan to put forward this purpose and to provoke discussion and decisions from members of the Committee. ACTION - all Boards, Commissions & Committees for up-to-date list of members. * Committee to decide on alternate Official Guest. Immediate action necessary. Please proceed. Members of Press, Radio and T.V. SUGGESTED PROGRAM: Regardless of the fact that this ceremony must have a solemn aspect, this is indeed a joyous occasion and therefore must reflect both. Therefore the program must be varied, short and concise. The area immediately surrounding the building must be in the best possible shape. Any advance work that can be completed, such as landscaping, etc., between this date and the day of the opening should be completed. Other areas - under construction - must be secure and closed to the general public. Flags and bunting could be used sparingly where advantageous. Because of the uncertainty of weather conditions it is recommended that all ceremonies be held in-doors. This will present many problems due to expected number of guests. With planning this can be overcome. ACTION - Sgt. Southward, Murray Walker. PARKING Special spaces (3) should be reserved immediately in front of (Navy Street) building for cars of official guests. Possibly an arrangement could be made with our Police Dept. to close Navy Street for the period of the Ceremony, similar to the occasion of the Sod Turning. The Municipal Lot east of the Legion Hall should be closed to the public and reserved for our invited guests. We should also request the Police Department to favour the invitations of our guests who may be parked on public streets. Invitations will be left on the dashboard of the car. ACTION - R.J. Cooksley - to H. Dyson. PUBLIC ADDRESS SYSTEM An efficient P.A. system should be installed in the building so that everyone might hear – if unable to actually see, the ceremony. The system should have portability of microphones so that voices may be heard from each location of the program. FLORAL ARRANGEMENTS Small corsages for Library staff on duty should be prepared. Additional flowers in suitable arrangement should be strategically placed throughout the building. ACTION - M.J. Cooksley, Contractor, Architect. NEWS RELEASE A special release should be prepared, in cooperation with contractor and architect, including photos, for distribution to Press. MASTER OF CEREMONIES A detailed step-by-step procedure will be prepared for the M.C. - covering every phase of ceremony. Some thought should be given to selecting an M.C. Names suggested have been: George Atkins, Bill Walker, Mrs. J. Caine, J. Cornwall, D. Pullen, R. Forsey. Once decision reached on M.C. - contact will be made and position discussed. PROGRAM OR PUBLICITY PAMPHLET Some thought should be given to the production of a pamphlet that could combine both a program and floor plan layout of the building. This would serve as a tour (guide) outline for visitors following the ceremony. The Architect should prepare a floor plan sketch of each floor in such a size so that a photo may be taken for printing purposes. Explanation by simple code of each room should be included.